Is there a SE razor user anywhere who doesn’t absolutely love the looks of a lather catcher? 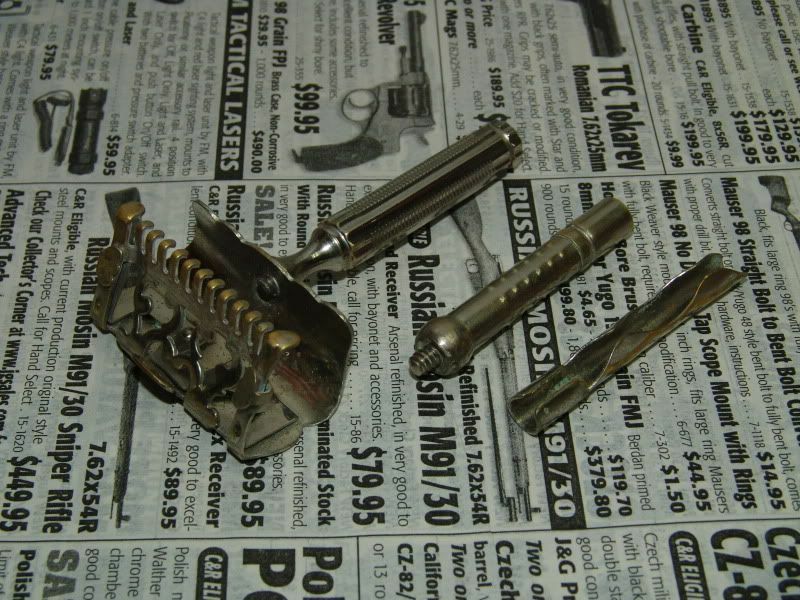 I for one find them the most interesting, intriguing, and desirable SE razors of them all. 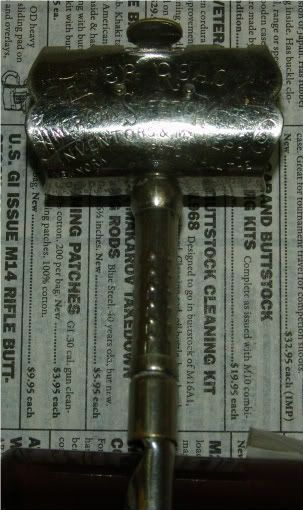 Waits Safety Razor Compendium tells me that the EverReady 1906 was designed for a rib back blade. The pictures I see in Waits shows the rib back blade as being a significantly thicker blade than our SE blades of today. The first one of these razors I managed to acquire was quite ugly with corrosion, but it was the one real surprise in a lot of razors that I bought on ebay. I cleaned it up and tried it and it was promising enough to prompt me to look for a better razor of the same model. Looking at the razor, the full lather catcher is obvious, and it has an open comb, which is one place your razor may have issues. Mine certainly did. All photos were taken after the minor repairs. 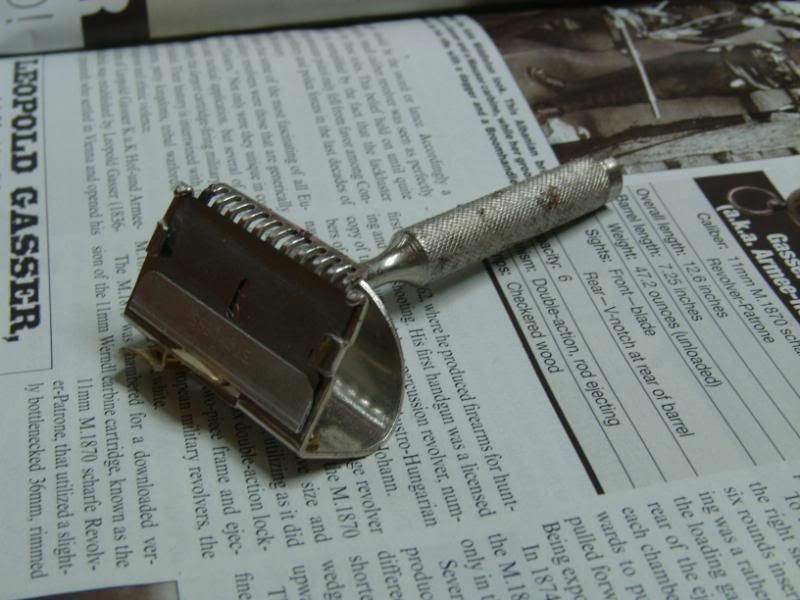 I finally found the razor I test here, and pictured here. It wasn’t perfect though. This razor is frail. My good condition razor had issues. The razor has spring loaded clips along the side that the blade passes under. These clips clearly should be free to move since they are spring loaded. One of my clips wasn’t moving. Another issue was the comb. A lot of the teeth of the comb were at different heights. Yet another issue, and the most pressing one, was that the blade would pass right through when attempting to load it. Allow me to digress. Basically this razor is 19th century technology. That’s a good thing. These mechanisms are extremely easy to look at and figure out how they work and what is expected. None of the issues with this razor were difficult to fix. 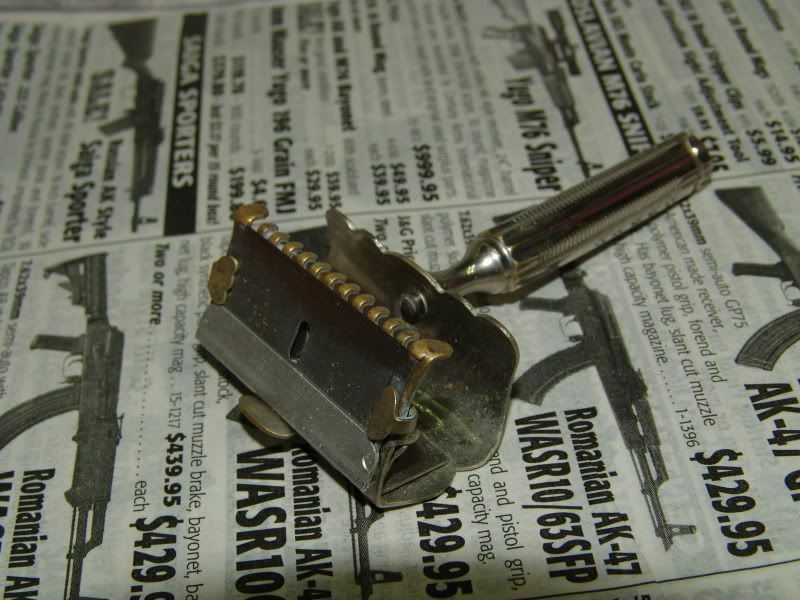 The razor is made of plated brass and brass bends easily. That was the cause of the problems and also the solution. Just bend things back into place. I love this technology! Just look things over, understand the way it works, and put things back into place. Obviously, unless the razor can hold a blade there is no reason to work on anything else, so that was the first issue to tackle. One side would catch and stop the blade, the left side wouldn’t. Examining it showed the stop portion of the comb to bent down and out of alignment. The solution was to bend it back into place so that the blade hit the stop. Basically, I made the left side match the right side which was good. Then I examined the side clamps and saw that the clearance on the offending one was lacking. It was pretty easy to figure out what needed to be bent to fix it and allow it to move. The other clamp had a bent hold down portion, again, easy to fix but I needed a smooth jaw long nose plier for that fix. I adjusted the other hold down for our modern thinner blade as well, again a simple bend of the part did the trick. That resolved the issues with the head as far as holding the blade went. You want the side clamps to hold the blade firmly down so that the blade contacts the stops. They are spring loaded, so as long as they put pressure on the blade you’re good to go. It isn’t rocket science. The next issue I had to deal with was the comb. The teeth on the comb were at all different heights. I first chose the setting that the majority were at and adjusted the others to the majority by eye. It was frankly, extremely aggressive. I like aggressive razors, thought to myself, “What the heck!”, and tried it that way. OK, it was very aggressive, far too aggressive even for me. Think blade glued to a popsicle stick sort of aggressive. I like aggressive but this was far more aggressive than I wanted. So my brain cells kicked in and I remembered the ugly corroded razor that I had. Long story made short, I adjusted the comb on the better condition 1906 to the setting on the ugly one that I had already used. Issue resolved (as it turned out). All of it done by eye. Just sight down the length of the comb and the teeth that need adjustment will show themselves. My point is that these are easy to work on. If you find a pretty one that needs adjustment either buy it for me, or buy it for yourself. If you drop this razor it might get out of alignment, but it’s easy to fix. The head is classical full lather catcher. You either like them or you hate them. I’m of the former as I suspect most SE razors users are. I love the looks of these heads. The handle on the EverReady is a tubular affair and extremely lightweight, short too. The razor with the lightweight tubular handle weighs 20 grams (scale is accurate to 5 grams), I didn’t weigh it with the extension. That handle is a diminutive 1 15/16" long and 1/16" shy of 3/8". It’s also quite smooth. It does have little bumps of it, but they are smooth as well. That weight makes this razor the lightest weight razor of any that I own and use. I like light weight razors, but that was even too light for me! And the feel of the handle left a great deal to be desired. I replaced the handle with a solid handle and I liked it much more with the replacement handle. Handles can be replaced easily since they screw in. It takes about 5 seconds to do if you have spare EverReady parts on hand. With the replacement handle the razor weighed a more reasonable 50 grams. The following measurements are with the replacement in place. At the widest part of the head it’s approx 1 3/4" wide. The widest part of the cutting head is at the base of the comb and is 1 11/16" wide. The handle I put on it is 2 3/8" long, and is perfect for me, but I understand others may have a problem with that. Again, put the handle of your choice on it. It’s requires a handle with the small thread. I have no idea what the actual thread is, but if you’ve tried to exchange handles on many EverReady razors no doubt you know what I mean. The entire razor from the blade clamp in the raised and locked position to the bottom of the handle is approx 3 9/16" long. The razor also comes with a handle extension that I assume is used to hold a blade for stropping. I didn’t do that. Todays blades won’t fit in it correctly. So while I have it it’s useless except maybe for someone who likes a longer handle. Makes no difference to me though sinceI changed the handle to one that I like better. So how does the razor shave? My first shave with it was when I had the comb misadjusted and it was far too aggressive. I also used the lightweight handle which I already discussed. After the adjustment to match the first (ugly) 1906 I own the shave was much better. It’s still aggressive, but not at all unreasonable. As I already explained, the teeth on the comb were misadjusted at first, but I adjusted them for a better shave. IMO that’s a strength of a razor made of brass. Sure, they can bend, but that means they can also be bent back into alignment. If one wanted to, I have no doubt that this razor could be turned into a real pussycat of a razor. The replacement handle worked out fine and I strongly suggest replacing the original lightweight tubular handle if one of these razors comes into your possession. I liked the weight concentrated in the handle. This is one classy razor that I absolutely love the looks of and it’s a great shaver too! Even better, if you don’t like the way it shaves, make it more or less aggressive, just go slow, large adjustments will have you chasing your tail. The changes required are minute and subtle. This is one very nice razor. I intend to send it off for replating. Yet another of my absolute favorite sort of SE razor, another lather catcher! But someone has to take the hit for the team! Who better than myself? The “Cru-Steel” refers to the “crucible steel” that the blades were made of. 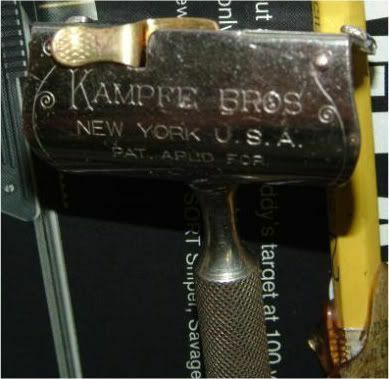 The 1913 Kampfe “Cru-Steel” is the first razor Kampfe made that was designed for SE blades. The lather catcher is small, but is larger than many other razors that follow it. 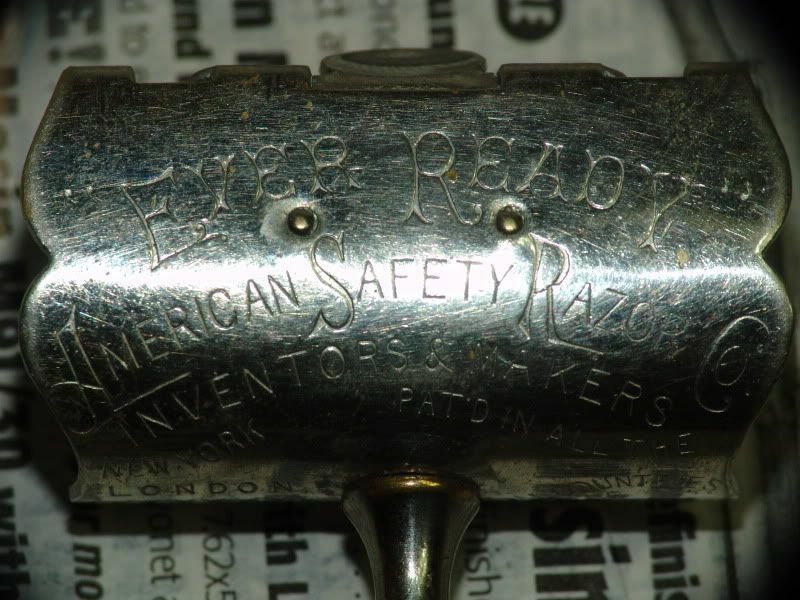 According to Waits, this razor is identical to the Hero razor marked “patented on Apr 14, 1914". Construction appears to be of chrome plated steel. It has blade clamps on the sides of the razor, but these are bent from, and are integral parts of the head. One would need to send it through checked in luggage to have them get thrown out of adjustment. The comb is of the closed comb variety. I didn’t test the head for durability or ruggedness, but I suspect it’s quite rugged due to the construction and material it’s made of. Unlike razors made of plated brass, this razor isn’t adjustable, but because of the construction, it will take a catastrophic accident to destroy it IMO. 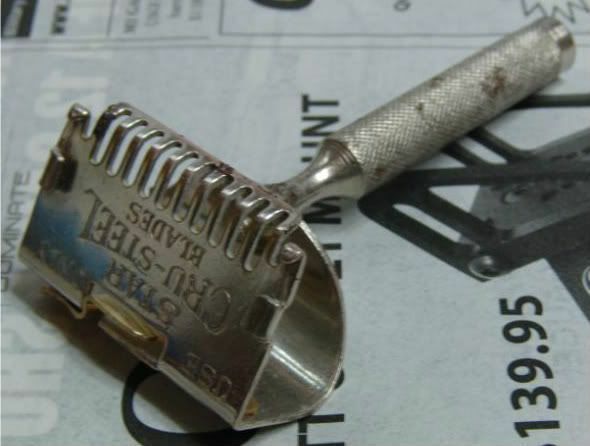 One problem that can befall a plated steel razor is rust. When the plating wears through or is somehow damaged the steel will begin to rust under the plating. Mine displays this damage to a small degree. I have no idea if it can be restored for a reasonable price, but I intend to find out. It comes with a decent handle, but if one needs to replace it an EverReady handle fits it. The Cru-Steel handle won’t work on an EverReady because the thread isn’t chased down far enough to work on it. There is very little to adjust on the Cru-Steel. The razor is plated steel, the comb is a closed comb and not prone to misalignment, unless it’s a razor that has been crushed. The only part not made of plated steel is the blade lock, and it appears to be of brass or bronze. The razor weighs 45 grams. The head is 1 3/4" wide at the widest part which is the lather catcher under the shave head. The width of the cutting head under the blade is 1 5/8". The handle (screwed in) is approx. 2 7/16" long and 3/8" in diameter. The razor as measured from the top of the shave head to the bottom of the handle measures 3 7/16" long. The handle is tubular and made of plated steel, so it has some heft and the knurling is very useable; I have no issues with it at all, and I’m handle “picky”. The handle is made to accept a stropping extension, but I don’t have it. Even if I did I have it, I have no doubt that it wouldn’t work with todays blades so IMO not having the extension is no loss unless you want the razor for historical accuracy. The shave with this razor is very aggressive. It’s an extremely efficient razor. I’ve used this razor a number of times now and as long as I’m attentive during the shave it gives me a great bloodless shave. On a day when I’m mentally off elsewhere during the shave, it takes that opportunity to strike, and it lives to strike. It can turn the face bloody in a heartbeat. The solution is to pay attention to technique and the shave; this razor absolutely demands it! If you’re having a bad day, please do yourself a favor and don’t use this razor on that day. I don’t have a str8 razor, but I can’t help but think that the shave with this razor would be something like using a str8. It ranks among the most aggressive razors I’ve ever used and I’m an aggressive razor junkie. I like this razor. I intend to have it restored or restore it myself, then have it replated. Another great review, Brian. I love my eight lather catchers for their looks and have two that I keep in my rotation when using SE blades. My favorite is my 1907 Ever-Ready. Not only is it a great looker but it's a great shaver, as well. I believe these earlier lather catchers were made for wedge blades but of the few of those blades that I own, I have never been able to have them honed to shave ready condition. It would be fun to try such blades but my usual GEM SE blades work just fine so I am happy. I don't know what the year is where they were first made for spined blades and I don't have time to look it up, but yes, many were made for wedge blades. They're fairly easy top convert for spined blades. The shaves I got with it were possibly better than my best shaves with a spined blade and they're not too shabby. Very curious, during the shave you'll swear that it's not a close shave and want it closer. But finish the shave and wait 15 minutes for the whisker shafts to recede and at that point it's a really close shave. 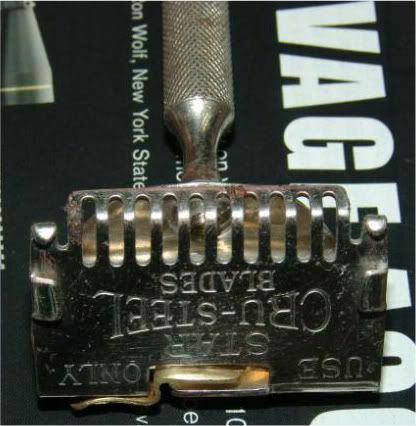 If you have a old and "seen better days" 1912 or OCMM* , a SEvette can be made out of it by removing all of the comb except for the corners of the comb. The modified razor will still use a spined blade, and be sharper than a honed blade. It's also no longer a safety razor and can make gashes in the skin if not used with the same care as with a straight razor. It's an experience and easier to achieve than a wedge blade. Of the 2 SEvettes I've made the OCMM version is my favorite. 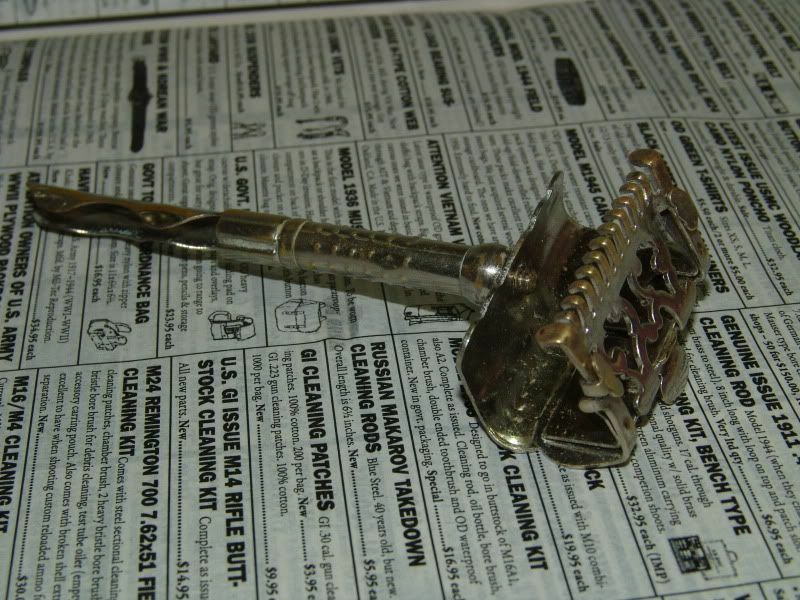 * it would be criminal to modify a working vintage razor. If an OCMM is found that is missing the blade stops that is a really good candidate for a SEvette modification. Since the comb is gone in the mod' the blade stop being missing is no big deal as the blade no longer needs to be held in proper relationship to the comb. The razor only needs to clamp the blade down. If you need pix let me know. Gotta run now though. I'm getting my stitches out today. Yay! :-)) Good one! I should have seen that coming! No, I had knee surgery to remove a piece of torn cartilage last Thursday. (05-03-2016, 05:28 PM)ShadowsDad Wrote: :-)) Good one! I should have seen that coming! Brian, may EVERYTHING have gone 100% right for you. Well, I had the left knee 'scoped 30 years ago. I was in a knee immobilizer and on crutches for a month. I had the right knee done last Thursday. Yesterday, Monday the stitches were removed and the Dr. told me to return to normal use, but back off if the knee told me not to do it. Oh, and don't walk 5 miles. He's got a pretty good sense of humor. I'm not into Soccer, but he was one of the team Drs for Manchester United, Dr. Wexler. Very happy with him. I have a 2nd follow up in a month but he told that unless something unexpected happens to cancel it when it gets close. He's that confident. All the best for a complete and smooth recovery, Brian. We can't have you wobbling to your cooking stoves. Brian, nice to see your reviews, once again!